The Standard Schnauzer is full of life and energy. They are a witty breed of dos and can get into trouble when given the opportunity to do so. Great with children and their owners, they love to spend time playing with little ones and live comfortably indoors. They adapt and bond with other pets residing in the same home, but can be stand off-like when a stranger encounters their environment. They also do not mesh well with outside pets such as other dogs entering their territory. While the Standard Schnauzer can reside indoors without very much maintenance, they will need to exert some of their energy outdoors each day. A daily walk, run or open field play time will be needed. They can reside outdoors, but are more commonly known as indoor dogs that can play outside for hours. They possess a wire-like fur coat that will need groomed weekly, usually around twice per week will suffice. Shaping is common for these canines also, which may be needed quarterly each year. They do not enjoy interacting with rodents and can be rather aggressive when they are confronted with one. They do however, make excellent watchdogs and love to protect their families. Being so easy to train and playful, they are a popular breed of household dog for families. Generally, they grow to reach around forty pounds as adult dogs and can live in smaller quarters if needed of them. One of the very few breeds that does not have many major health concerns to worry about, the Standard Schnauzer is a healthy breed. They have been noted to develop CHD and follicular dermatitis from time to time. The vet may recommend screening for any hip issues as they age, but overall they do not require many trips to the vet as some other breeds do. The average lifespan of a Standard Schnauzer is twelve to fourteen years long. They are simple hounds for training during their puppy months and make very easy pets. The Standard Schnauzer is the oldest of the three main breeds of popular Schnauzers. Originating in Germany in the Middle ages, they were known for being exceptional guard dogs. Guarding everything from families to buildings to farm lands, they are very observatory creatures. They have been a popular choice for hunters worldwide and have also been commonly used as competitive dogs in shows as well. Most Schnauzers were utilized as law enforcement canines. They began their efforts at show dogs in 1879 in Germany as Wirehaired Pinschers. They possessed such an interesting look that set them apart from other dogs in the show that by the time the 19th century came about, they were a dog show fan favorite. Used in World War One for their wise demeanors and placed them as dispatch carriers. 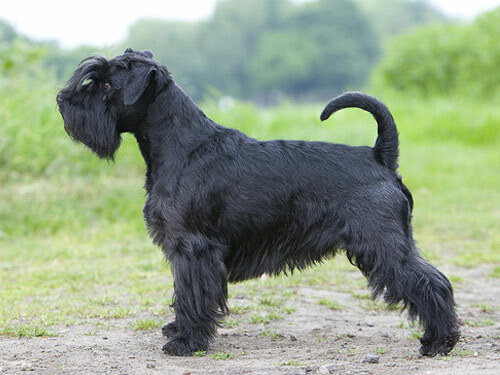 They have also gone by the name Mittelschnauzer and have since grown in popularity as household pets in the United States.